Is It a Piano, a Pianoforte or a Harpsichord? Is It a Piano, Pianoforte or Maybe a Harpsichord? What’s the difference between a piano and a pianoforte, and is the harpsichord, which looks similar, really a piano? The name sounds similar, sure, but are the piano and the pianoforte the same type of musical instrument? The answer is yes. Piano is simply a shortened name for what, by and large, originated in Italy as the pianoforte. According to the Metropolitan Museum of Art in New York, the pianoforte was invented by Bartolomeo Cristofori around 1700. He had been in charge of building and caring for the harpsichords (find out more about these instruments below) belonging to the Florentine court of Grand Prince Ferdinando de' Medici. "The poet and journalist Scipione Maffei, in his enthusiastic 1711 description, named Cristofori's instrument a ​'gravicembalo col piano, e forte' ('harpsichord with soft and loud'), the first time it was called by its eventual name, pianoforte," reports the museum’s website. The instrument Cristofori invented was described as "resembling a harpsichord … with hammers and dampers, two keyboards, and a range of four octaves." The action of his piano was “highly complex and thus expensive, causing many of its features to be dropped by subsequent eighteenth-century makers, and then gradually reinvented and reincorporated in later decades." The true forerunner to the piano, however, is the dulcimer (scroll down for more on these instruments) rather than the harpsichord. 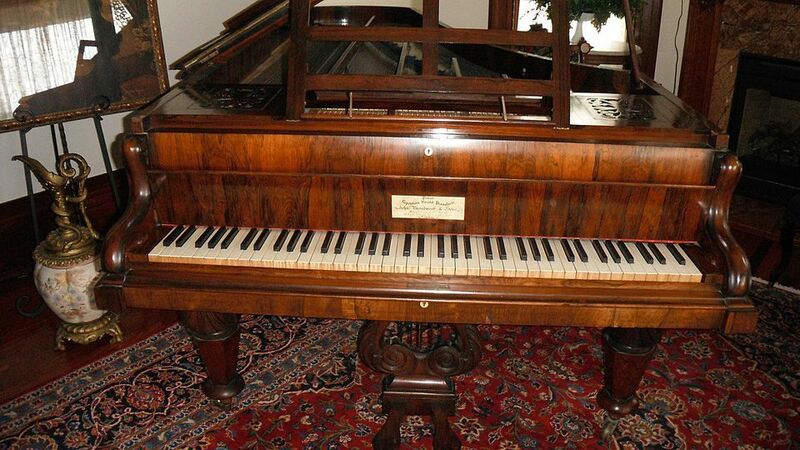 There are three known remaining Cristofori pianofortes in existence, and the oldest of the three resides in the museum's collection, and they are obviously valued quite highly. Today the term pianoforte is sometimes used to describe antique pianos marked as such, like the one shown above that resides in the Queen Anne Mansion in Eureka Springs, Arkansas. This Victorian example originated in London in the 1800s. How Does the Harpsichord Fit In? Although the Harpsichord has at least one keyboard, sometimes two, and looks much like a piano albeit a rather elongated version, it is actually a very different type of instrument due to the way it functions. While a piano uses hammers (like its forerunner, the dulcimer, shown below) and dampers to strike the strings within to make beautiful music, a harpsichord performs very differently. When the keys on a harpsichord are depressed, the strings are plucked, rather than struck, with either quills or leather picks called plectra. Think about the way the strings on a harp are plucked with fingers as the instrument is played and that will give you a good idea of how the strings are manipulated within a harpsichord. The sound produced is very different for this reason. The harpsichord was very popular, even with classical composers, in the 18th century until the pianoforte all but replaced it. Music made by pianos, quite simply, can be heard in a large concert hall while the music of the harpsichord does not carry as freely. Moving into the 19th century most homes of means contained a piano which was widely used for entertainment, during holiday celebrations for example. While a small version of the harpsichord may be referenced as a spinet, virginal, or muselar, these are all essentially forms of the same type of instrument. This harpsichord with walnut case and brass hardware bearing the serial number 55-168 was built by John Challis of Ypsilanti, Michigan. Challis is known for modernizing the harpsichord and built approximately eight harpsichords a year in his workshop where he employed two assistants beginning in 1930, according to information published on the Ann Arbor District Library's website and the antique valuation website Prices4Antiques.com. How is the Dulcimer Similar to a Piano? The dulcimer, a very old style of musical instrument mentioned in literature as far back as the Bible, actually looks very different than a piano. Essentially it is an elongated box of sorts that has strings stretched over its length. It is played by striking the strings with hammers held by hand. This is essentially what happens on the inside of a piano when the keys are depressed. So, even though the harpsichord looks more like a piano, the dulcimer is more closely related in its functionality.